The wait for Warcraft III has been long, but its been worth it. Everything about the game has the look of a well-polished product, a labor of love that its designers wanted to be as good as they could make it before releasing it to the world. Blizzard shall release no game before its time ... and it's gamers that benefit. The first thing Warcraft veterans will notice about the game is the addition of two new playable races. In addition to the familiar orcs and humans, Warcraft III adds the undead and the night elves. Fans of StarCraft will notice something a little familiar about the undead, with the creeping scourge generated by their structures and the ability of their workers to summon buildings and then go back to work invoking memories of the Zerg and Protoss. Each of the four races has its own unique look and feel, and each lends itself to a different style of play. While every race competes for the same resources - gold and lumber - the races are not all the same force with different sets of graphics. The humans feature strong defenses and healing magic, the orcs, strength and brute force, the undead can raise armies of skeletons with their dark magic, and the night elves emphasize stealth and mobility. The units of the races are expertly balanced - no race or unit dominates the game. Every unit can be countered in an expertly crafted paper-scissors-rock balance of power. Carefully balanced forces and sound strategy are necessary to carry the day. The game's campaign weaves an interesting storyline through a series of missions designed to introduce you to the strategies and units of the game's four races in turn: humans, undead, orcs, and then the night elves. The story centers on the invasion of the world by the Burning Legion (a horde of devils and demons) and features an intricate and twisting plot line that stands above the typical predictable and plodding plotlines too often found in games. The storyline is advanced by high quality cutscenes that are integrated directly into the game - when the black bars used to give the cutscenes that letterbox look are faded out, you instantly take control of the action. You'll also be treated to some very well done CGI cutscenes that are of the quality usually reserved for top-tier animated movies. There is so much detail in these cutscenes, you'll have to watch them over again to catch all of them. In fact, all of the game's graphics are gorgeous and detailed. 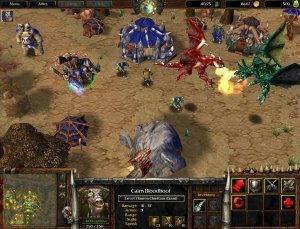 Warcraft III marks Blizzard's entry into the world of 3D graphics, and the result is colorful, animated maps that let you zoom in for a close-up look. The graphics can be described as cartoonish, but not in a bad way. They give the game a unique look and feel that's very much in the spirit of the original Warcraft games. Blizzard could have taken the easy route and packed the campaign with tried and true types of missions of the wipe-your-foe-off-the-map or keep-the-key-unit-alive variety. Instead they packed in a surprising amount of diverse and varied missions that will constantly challenge you and keep you interested in seeing what comes next. I'd love to tell you about them, but I really don't want to give away anything for fear of spoiling the game's plot for you.